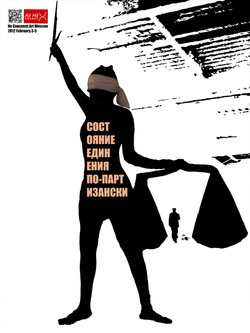 Five prints were made of this poster. One is at the Russian Library Archives, Moscow, RUSSIA (unnumbered). One was given with much much love to Marika Maiorova (numbered). One was sacrificed for art sake (unnumbered). One is in Cerise Tail's lair (numbered). The last one is waiting for it's "AHA" moment (numbered). 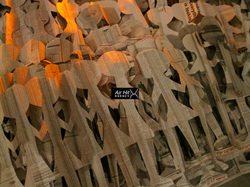 Here is the link to view the photo documentation of the performance. 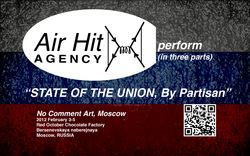 Cerise Tail and Houston Bowery perform "Underground Shelter" in Moscow, Russia. September 22, 2012. 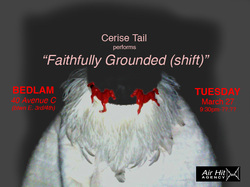 Cerise Tail performed "Faithfully Grounded" at Bedlam Bar, Manhattan, NYC in March 2012. 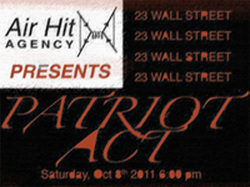 "AHA" at the historic house of JP Morgan (23 Wall Street) during the LOFT IN THE RED ZONE exhibit September 2011. 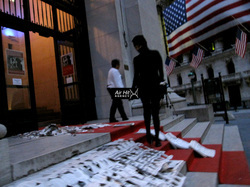 "AHA" on the steps at the historic house of JP Morgan (23 Wall Street) during the LOFT IN THE RED ZONE exhibit September 2011.